Every so often I get tired of lettuce as a salad. Tonight I just wanted something cold and crunchy and low calorie. These are so good and really dress up a meal. Place the peppers directly on the grill or on the oven shelf. If you are roasting in the oven place a tray one shelf down to catch the juices. Roast until the pepper skin has charred and blistered then turn to do all the sides. 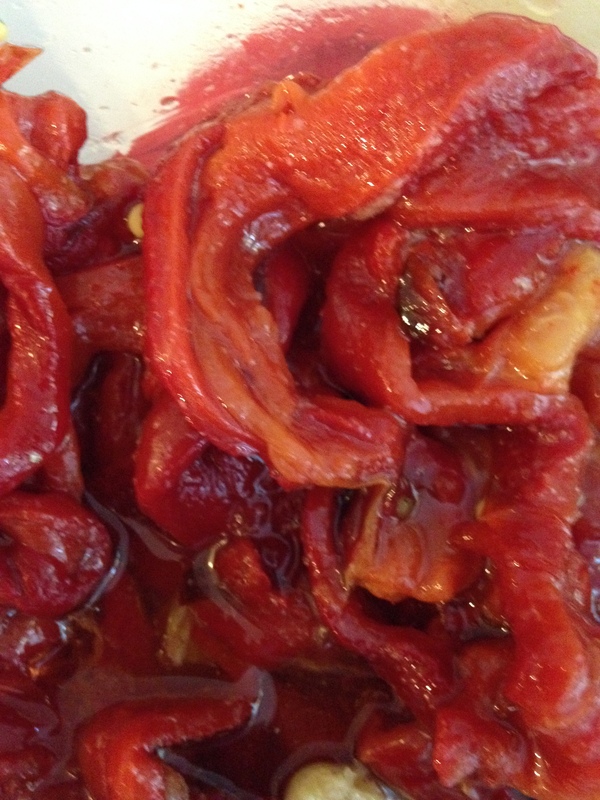 Place the charred peppers in a paper bag and wait five minutes till they are cool. Peel the charred skin off and take all the seeds out. You end up with this clean red pepper. Slice the pepper into strips and place in a bowl. Add everything else and just stir to mix. Keep in an air tight container because the garlic will permeate everything in the refrigerator. These are great with chicken, salads, eggs, on a sandwich or just plain. Save the oil and use it to cook with or as the oil in your salad dressing. If the garlic is left, use that when you saute meats or vegetables. Nothing should ever go to waste. These are so much better then the jarred ones, cheaper and very easy to make. This is one of my favorite meals and so easy. Brush the meat with the olive oil and sprinkle with salt and pepper. Turn over and repeat the turning to get the grill marks. Grill to you’re liking or you can take the steaks off the grill and finish cooking in the oven for six to eight minutes. Make a baked potato in the microwave and then fill with a pat of butter, salt and pepper and sour cream. 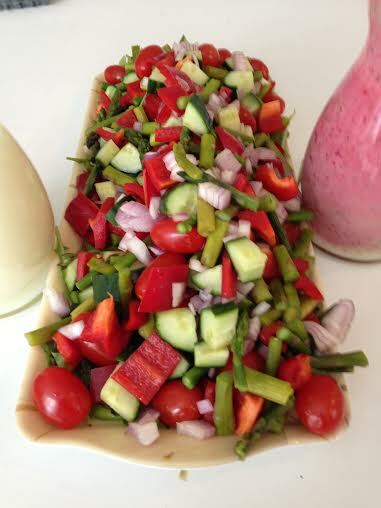 Mix a quick salad of cucumbers, red peppers and vidalia onions. Dress with some balsamic dressing. I also cut thin slices of Italian bread and spread it with blue cheese. Then I toasted them in the toaster oven to melt the cheese. Great meal for fathers day. 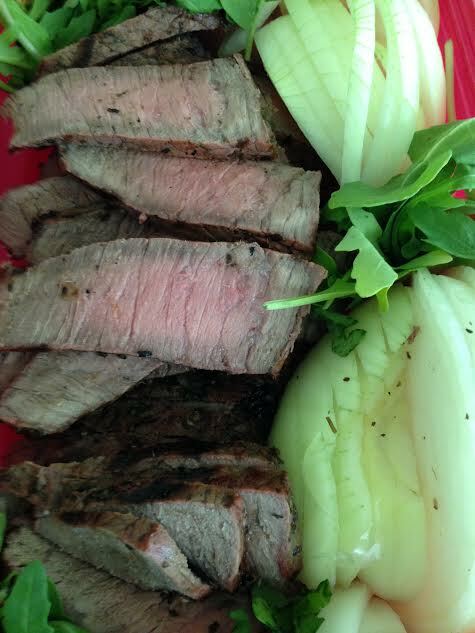 A Caesar salad or lettuce wedges with blue cheese dressing is really nice with the steak.